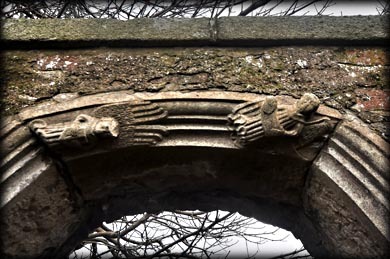 Jóse a fellow enthusiast, had acquired permission to visit the old parish church and gatehouse on the Lyons Estate, in Kildare, and I was delighted to accompany him. It is a, 22 metre long, nave and chancel church, built from undressed limestone masonry, apart from the excellent dressed quoins of the east gable, see image above, and the chancel arch. The church stands in the northwest corner of a walled graveyard. 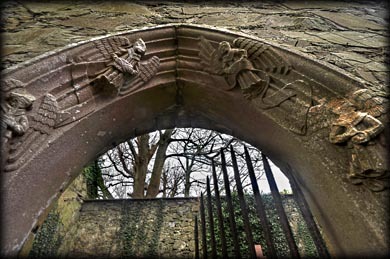 The gated entrance to the graveyard features two delightful carved angels, and another four angels decorate the rebuilt doorway in the south wall of the church. The base of a font is built into the bottom west jamb. See image below. There is no access to the, mostly rebuilt, chancel, pictured above. It is presently used as a private burial vault. Two blocked ogee windows are present in the south wall and there is a pointed arched window in the east wall, see top image. A commemorative plaque to Richard Aylmer is built into the north wall of the nave. It bears the Flemming coat of arms on the left and another coat on the right. 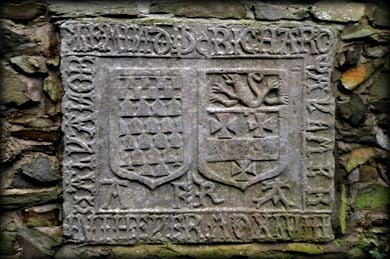 I have read that it is in commemoration of the marriage of Richard Aylmer to Eleanor Fleming of Slane in 1548. Below the shields are the initials AF and RA. The second coat of arms is difficult to identify, I presumed it was Richard Aylmers coat, but it is not a typical Aylmer coat of arms. Built into the outside south wall of the nave is a small rectangular memorial monument. 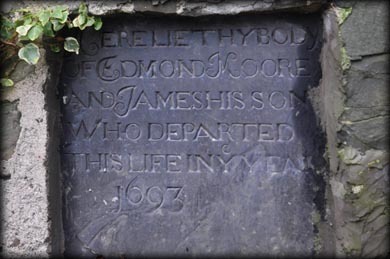 The inscription reads; Here lieth the body of Edmond Moore and James his son who departed this life in year 1693. 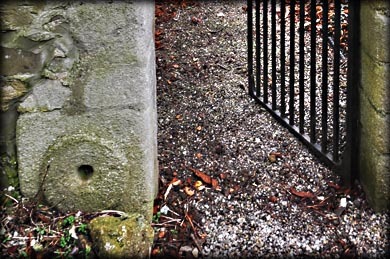 Situated: The graveyard is located on the portion of the Lyons Estate now used as a Research Farm by the University College, Dublin. It is private property, permission must be acquired before visiting. Discovery Map 50: N 9744 2850. Last visit Jan 2018.